This site is dedicated to all who believe that a Very Good Life depends upon our capacity to open our hearts and minds to the goodness which surrounds us- and sharing it. The viewpoint expressed here is that of a traditional woman who believes our most important legacy is what we leave behind in the hearts of others is our most important legacy. Godspeed and Good Fortune to all who enter here. Our little Eden, complete with the occasional snake, is USDA Zone 9B. Nested high in a chaparral filled valley, ground level is 957’ above sea level. The view is incredible. The specific climate is mostly Sunset Zone 20. I don’t want stalkers, so we’ll skip the GPS info. It is pretty glorious to live here in the land of 2 seasons: Fire and mudslide. This journal is filled with enthusiastic strivings to fulfill the suburbanite fantasy of keeping a country home. As context is important, on occasion a bit of history or commentary on current events is dropped in. This site, including the pictures and text, is protected under the Digital Millennium Copyright Act. I grant you prior permission to use my feed, quotes of 100 words or less as long as you give credit. If you wish to use more, please e-mail me. If in any case, I have posted images or text against the owner's wishes, please contact me so I can adjust asap, with my sincerest apology. Thank you God that You did not make my destiny to be plant in a sunny garden. When the real temperature slammed up to a record-breaking 115.8°F this afternoon. Not even our heat-loving chihuahua mix Tahoe wanted to sunbathe. Quite a memorable end to a very comfortable summer. Still, beauty exists in every season. What's a gardener to do after 9 am on such a day? Spend it inside exercising that part of the brain where dreams evolve. Garden-gazing over the Internet in the comfort of an air-conditioned room means never having to say you are sorry for not remembering to put on sunscreen... or explain how you were stung by the bee lounging around the flowers while you were being perfectly friendly. As Kenny complained as a little boy, " I just petted it." First up is the Lincoln Avenue Nursery. Enjoy the energy of color in this low water planting at the main building's side. Bay laurel trees rise up behind a middle ground of Mexican sage and foreground of one of my favorites- calandrinia grandiflora. Any strip of dryish- land fronting a sunny wall would enhanced with this simply rhythmic planting. If dealing with the upkeep of an operating fountain is not "your thing". Succulents overflowing the edge of this classic tired model is a strong focal point without the maintenance. If you value humor, your garden should include a touch of humor. Restrained playfulness is expressed in this rock and iron scorpion ornament. The family of ants playing near the water feature is also a smile builder. 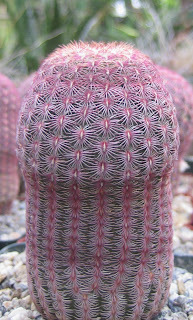 This is a sidewalk view up an aisle at California Cactus Center. A visit there is always enlightening. Desserts can be lush habitats. This pant is new to me.. Known to her friends as "Pink Lace Cactus", you can find her listed in academic horticultural sources as Echinocereus pectinatus v rubrispinus. Viewed in a grouping and then as a single specimen, it encouraged different emotions.. The top image I am absorbed by the undulating symmetry and inspiring coloration. My inner Irish imp made me take this picture. I assume you see the similarity to a specific masculine appendage. Proof that perspective matters on the impression made. Try to keep cool and remember to seek out a daily dose of laughter. Smiling and laughter breed happiness. The world will go on whether you are of good cheer or not. Choose to be happy. The Grand Ballroom at Hollywood and Highland might best be known as for holding the Governor's Ball post Academy Awards. Last week it was venue for a different kind of governor. 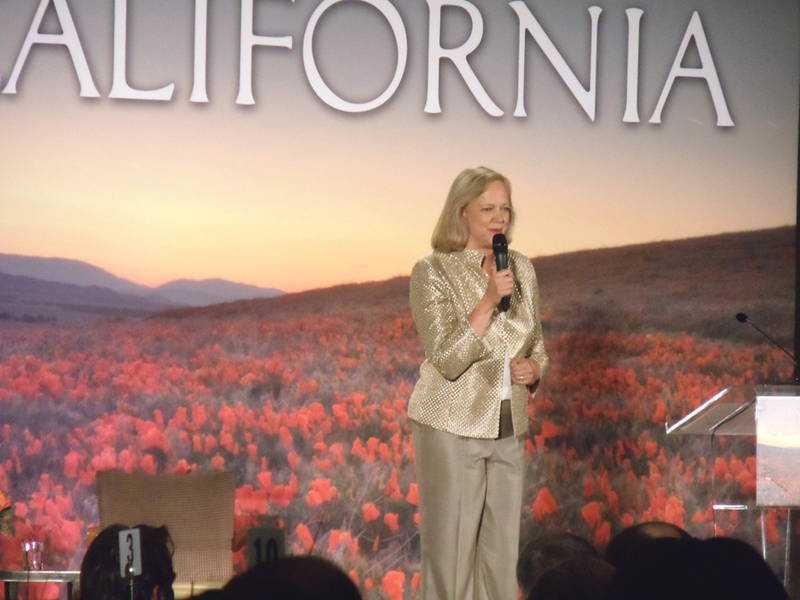 Most accurately, candidate for Governor of California, Meg Whitman. While I was about $999 short to attend, I am just as happy to ogle images from the evening where the tall and handsome Daryl Bowler escorted his mother, Trisha, through the elaborate complex. 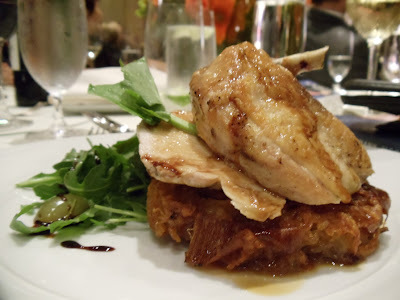 Please enjoy her photo of how chicken is presented at an event which is best described as high-end. Sigh at the loveliness of dessert. Pictures have no calories- enjoy as often as you like. Consider joining us in voting for this woman to be Governor of California. In my time, I have been to lots of political events. Both parties. I have never before seen someone brave enough to use our state flower- the California poppy- for the campaign's symbol. This represents the kind of out-of- the- box understanding of what is of significance in this state that is admirable. Always the curious writer- I want the interview! However, politics is not my top priority or passion. My family is. Our dinners come in way-under $1000 for all of us):- And are just as GOOD. The big jar or Morello Cherries looked so lovely at Trader Joe's that I just had to bring it home. 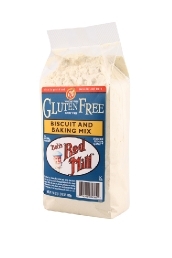 With Celiac disease being more commonly diagnosed- a package of Bob'sRed Mill Gluten Free baking mix ought to be in every one's cupboard to accommodate drop-in visitors with this dietary restriction. Blend dry ingredients. Toss in lemon zest. Thoroughly cut in butter with a pastry blender. Press evenly onto the bottoms and sides of a buttered medium oblong baking pan. It will take aprox 18 minutes for the crust rim to toast to a golden blonde hue. That leaves plenty of time to make layers 2 and 3. Layer 2 is the 2 egg version of a lemon meringue pie filling. Consult your basic cookbook or Internet site for the recipe. When finished, it can go straight onto the crust. Morello cherries and syrup separated and saved. Mix the cornstarch with sugar in a medium saucepan. Let the light syrup drizzle into this while stirring to avoid evil lumps. Keep stirring over a medium heat where it will thicken over a medium heat. When the syrup starts to bubble, the sauce will be glossy and begin to coat the spoon. Stir in the cherries and try not to sample the pan clean. In about 3 minutes, turn off the stove and let it all cool a bit to make sliding it over the lemon filling easier. Layer 4- Consult the basic cookbook source for a 4 egg meringue. Smooth it over to seal the edges of cherry filling and bake as your source on this directs. When you are done- get ready for the love at first bite. 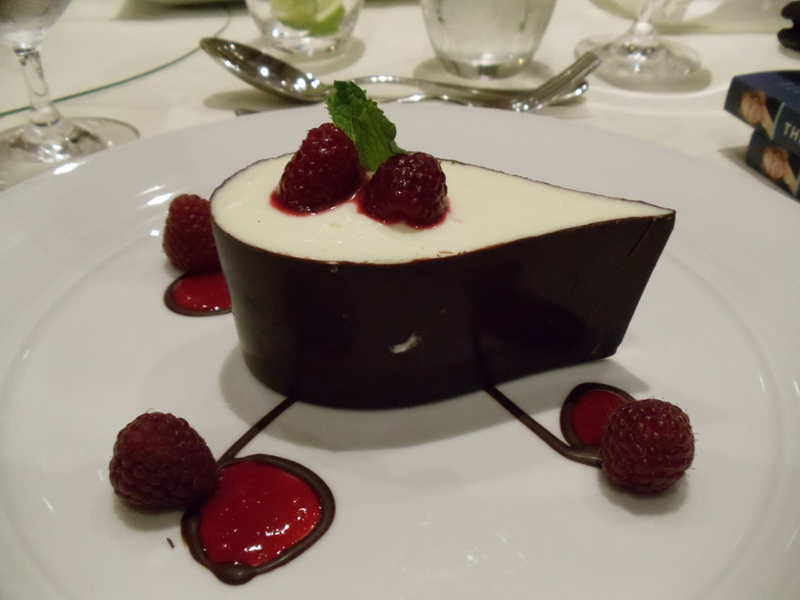 How good is this dessert? My 105 pound mother-in-law had two heaping servings. Images from campaign fundraiser by Trisha Bowler of Diamond Bar, CA. In Colonial America, festive celebrations were feasts. The abundant food of the New World was laid out on temporary serving tables made by placing boards across wooden construction horses. It was on a trip to Williamsburg that I learned of groaning boards. The pursuit of happiness, that influential concept brought forth in the United States Declaration of Independence, is achieved not just by acquisition, but through voluntary sharing. Since the Pilgrims first gave thanks in Plymouth, the concept of having enough extra food to serve any hungry wandering battalions of soldiers or Indian tribes remains an American tradition. As if this were not enough, the waitstaff of 7 eased through the building throng with tray after tray of hors d'oeuvres style beef wellington, tostadas, ahi tuna on won ton crisps, chicken pot pie.... I will stop here before I get fat salivating over the memory!. Shannon is not only, in the words of the smitten Kenny Plunk, "Smart and beautiful," she is hardworking. The logistics- she handled like a seasoned pro. The date was somewhat decided by when Orange County cover band The Green Natives was available. Along with tables and seating, an extra large dance floor was brought in. A detail that made dancing so much more fun than if it had been on concrete pavement. And Sheryl Stevens. Not a relation by blood. But through love. One of the kindest most honorable women we know. By the oddest of circumstance, she is a friend to both Kenny and Shannon. That is a story we will leave until another day. Happy birthday to Billie Plunk. YOU are our sunshine. Friday Philosophy will return next week. Shannon Morris and her mom, Jeannie, are largely responsible for the spectacular engagement party last weekend. 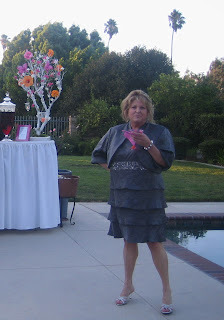 A successful hair stylist with José Eber in Beverly Hills, Shannon has learned lots of "secrets" to pulling off events which she used to act as her own party planner. Shannon used the color scheme of pink and orange to establish a festive mood.By not rushing straight into the party, she could spend the last 6 months collecting items to use as she came across them. 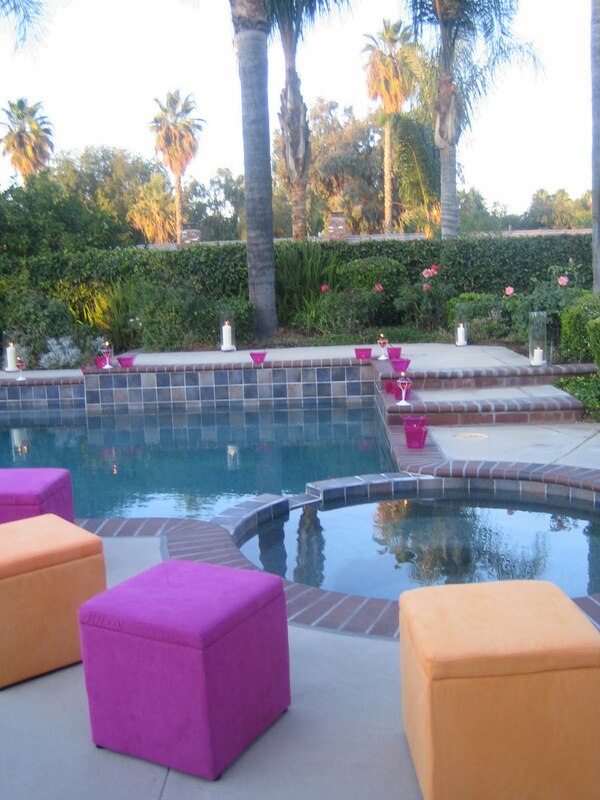 This friendly mingling area was created for party-goers. A savvy shopper, Shannon found the ottomans at Walmart. Shannon found the bases for table decorations in downtown LA, "When I got the trees they were natural brown and bare. I spray painted them white and hot glued gun flowers and moss." For added twinkle for the cocktail event, she created hanging votive lights. She explains, "With my mom's help I made the decorations" The table centerpieces were lanterns from Pier 1 and Cost Plus. For "the look" she wanted, she simply took out the glass and spray painted white. Mirrors from Michael's and IKEA magnified the sparkle. 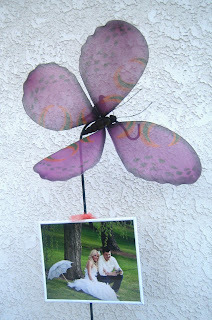 Jeannie made these wonderful gossamer butterfly stakes that called attention to lovely photos of the engaged couple. 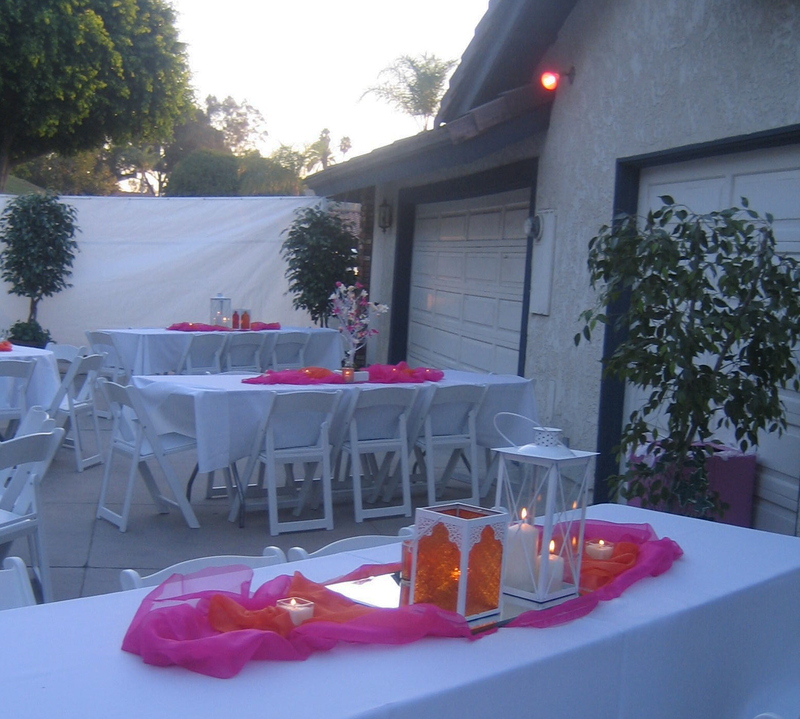 They were arranged along a wall to show the way to where the main table seating and dancing would be held in a generous side yard. As the sun went down, twinkling candlelight from votives enhanced the romance of the setting- and made walking around safer. It was really nice getting to meet Miss GenninaTan. Seated far right, she is one of two 10-10-10 bride-to-be in our lives. I am so pleased she chose to sit with my mother in law, Melva and her "children", Nancy Thayer of Wyoming and Gerry Plunk, aka- my one and only date for 35 years. "Shannon lights up every room she walks into." Kenny Plunk at their engagement party last night. Craig and Jeannie have a photo of when they first met. He is peaking into her crib. Kenny fell in love with Shannon the moment he saw her. He was 16 and she was 14. I love this family for how they have loved our son. Here I am, unusually well "cleaned up"for a writer; surrounded by the men in my life. (L-R) My husband is known to his family as Gerald. To those of us who met him after UCLA- he is Gerry. Kenny was named for Gerry's dad- if someone calls and ask for Kenneth - we know the person has never met him. On the right is his big brother-Trevor. He flew in from the Rocky Mountains to be with us. The lovely Amy Lamping is following Kelly into the house. We've known Amy since she and Trevor were in the 5th grade. She must have made an impression on me. When adult Trevor living away from the family nest he fessed up to dating a girl from Diamond Bar. He said her name was Amy- I asked, "Amy Lamping?" There really is too much great info to squeeze in one post. I will never forget last night. Thank you Craig and Jeannie for opening your home and garden for this celebration. Gold is a valuable commodity. Laughter more so. 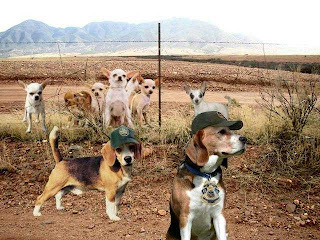 I think it was Judy who sent me this picture titled, "Border Patrol." If you like it, you will love Clean your screen. This morning, when Gerry's dog took me outside for her morning walk, it was 53° outside. The light fog settled in- this afternoon probably won't reach yesterday's high temp of 93°. A good day to catch something. Like a sense of humor. Humor is infectious. Pass it on. Pray good humor goes epidemic- and there is no cure. Thanks Patty Gee for the for Clean Your Screen link. Reno thinks that dog is a great role model. If life were a multiple choice test then the logical spot for the barbecue would be as simple as reading a diagram. According to the floor plan, the logical spot is against the open southern edge of the patio. However, we don't live on a piece of graph paper.What the diagram can't relate is the effect of the ocean blown breeze sailing through our canyon. The "logical" spot is where the wind blows out the cooking flame like a candle as easily as if it is a candle on a cake. We can't stop the wind. Unless we accept our limits and work one step at a time. When we accept challenges always follow even the best ideas well implemented, we are doomed to frustration..
One of the realities of my personality and how it relates to my husband is that I absolutely can't stand when he is displeased. Unfortunately for his dreams of free time, my mind is wired to come up with solutions. Ones that I need his expertise if he doesn't want to come home from work to discover his wife having been in his man-cave playing with his his tools. How to keep the barbecue where the floor plan and I agreed and still have peace? My mind pulled up images of glass windbreaks at coastline and canyon homes. A call to Brundige Glass found them merged and moved in with Anaheim Glass. The ever friendly Buzz made sure I had the correct glass- tempered- cut to needed size waiting for our Chevy Avalanche to pick up. A couple dollars dropped at the big box store. Gerry sawed redwood 4 x4's into posts and framing. Painted to match the patio, the structure reads as a large window in the landscape. Life is an essay test. Study up. Embrace the challenge. It keeps life interesting. 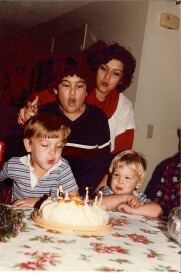 Picture from Christmas 1983. My sister, Gina, with son Manny Chavez standing. (L-R)Trevor and Kenny Plunk. I thought I was running a temperature yesterday.Checking the thermometer recording- most likely it was just soldering on a 92° F afternoon. This morning, "the" window is complete, but not done. Much like writing, once the draft is sent to the editor, there is still work to do before publishing. For one thing, it needs a name. Any suggestions? The window now rests on a glass top patio table. Light streaming through the glass allows details-including flaws- to show themselves in a way not apparent as when this personal vision of paradise was laid out on an opaque plywood surface. While there is still work to be done- this is a major milestone- deserving to be celebrated. With the weather still warm, something simple is in order. From the garden; in the garden. Tomatoes- still warm from the garden, sliced. Corn; barbecued, just salted with butter dripping down the sides. And Ebelskivers. Those delightful Danish miniature pancakes that put to shame nutrition-challenged fun foods from Ding Dongs® to donuts. The indented pan deserves to come out more often just for the joy that always accompanies its use. Kevin Craft's Ebelskivers is a delightful treasure trove of 40 inspirational recipes run the gastronomical gamut from savory through sweet. The pan, the book, all the accouterments are available through Williams- Sonoma. Which version will be served tonight- I don't know. Life is happier when you let the moment make some decisions. Nine- Eleven. The combination to our hearts opened on a clear-skied September morn in 2001 when the world stopped turning and we remembered as a nation that we are one people capable of courage and conciliation. Our collective memory is wafting. Let today be a day to refresh the goodness of America when we pull together. I invite you to re- visit George Bush's address to the nation, given 9 days post terrorist attack. The contemporary record reviewed from the perspective of now is a landscape of how far we've come; how far we have yet to go. Read it. Watch it. Understand why there is actual reasoning behind the controversy centered in New York concerning a certain proposed Islamic Center to replace a building damaged by infamous attack. The label of the project depends upon the purpose of the speaker. Some call it the Cordoba House after a historic Spanish city of religious/ cultural importance. Some call it Park 51 for its address, hoping the locked and loaded connotative connections associated with Cordoba disappear from discussion. With respect. Particularly to my Islamic friends; to visitors from other countries seeking understanding. In this country we stop construction for many reasons. Land where dead dinosaurs roamed. Ground where where fragments of Native American ancestors may lie. We stop construction for flies of questionable value, not for any particular significance, simply because they are rare. In prioritizing our values, please understand the sensitives of survivors of the 9/11 victims are rightly the highest consideration. The United States is a vast nation. Wounds do not heal by force. Show your good faith by building this center elsewhere. Let wounds heal as they must. With time. Be patient with those who grieve. You cannot give them their loved ones back. You can only offer understanding, condolence and justice. Someday this all will pass. This is just not that day. 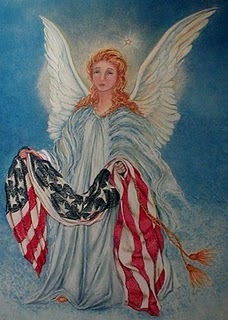 Gloria's Tears is by Washington State artist Gloria Whitley is pastel on sanded paper. Tear's flowed as she created it in the days that followed 09-11-2001. Interest in her work can be sent to her in care of her newly founded blog Beads and Banter. A glorious 54° Diamond Bar morning to you. Outside, the hummingbirds fight for their place at the feeder, butterflies dance through the air. 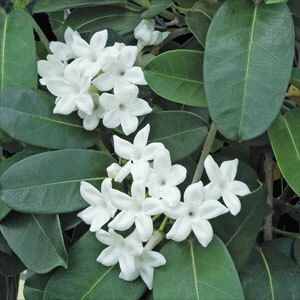 The twin stephanotis at our entry are finally tall enough for their lanky tendrils to reach the fishing line strung across the front eave. I dream next summer the arching arms will join hands above the picture window. Then angels and visitors will be welcomed with with bridal bouquet scented air. Yesterday's recorded high temp was 88.5°. A good day to split between writing and "doing cardio" at the mall. We have a cocktail party coming. Our youngest son's engagement. Clothing is not normally something writers are known to obsess about. But this writer graduated from the Fashion Institute of Merchandising. Dressing to the occasion as a sign of respect. Yesterday included an afternoon "scoping" mission. Learn what's on the market. I learned that there is a simplicity to being male that I hope men appreciate. My husband will decide if a new suit is warranted (So Cal is rather informal. He thinks his closet holds a couple suits that are just fine. I think he may be in denial). In either case, he can go from being my Saturday handyman to 007 in under an hour. I started getting ready last month, still need to shop and it will take me a full week to get from basic deadline infused writing fiend to presentable. My feet ached and my mind wandered. The sound and aroma emanating from the local Williams- Sonoma tempted me to abandon my search temporarily. Inside, 1" chicken cubes dredged in the flour spiked with smoked paprika, pulled through buttermilk , then one last time through the flour were dropped into bubbling peanut oil then salted were a renewed revelation of how good something so simple can taste. The joy of learning comes when it is shared. A quick stop at the market for fresh chicken breast tenders and my husband came home from a long afternoon into evening of meetings to a lit fire and the scent of real food cooking. Earlier this week, an attacking glass sliver threw the turning over to finish operation into a momentary panic. One band aid later- the copper foiling is soldered front and back. One cracked pane needs rreplicating and replacement before the lead caming is puttied on the backside. Then my part is complete. The project turned over to my husband for framing. But like a formal degree, the education of this project won't end when it is framed and hung. The Breville Deep Fryer is available through Williams- Sonoma. When the LA County Fair comes to town- soaring temperatures are Mother Nature's ritual. 107.2° .That was where the misery index rocketed to when Miss Lauren poked her head over the garden gate to question if it wasn't a little hot for me to be precariously clinging to the hillside- clippers in hand. You know you are a garden addict when the temperature is that horrid and you are still puttering about in the garden. To test my resolve must be why the angels on high send certain company. Thorns to staple extremities and tear clothing before "its time". Venomous spiders. Snakes. 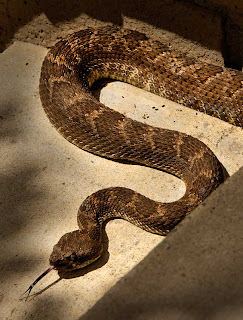 Actually, there is a time when I am happy to see a snake. When a rat runs by. 2010 hasn't been too bad a year for rodents. 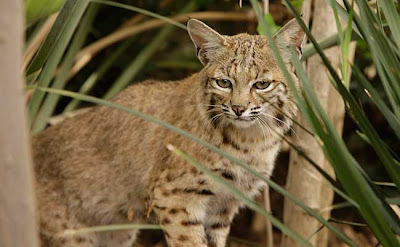 Probably the combination of big cats and coyotes. Those roaming bad boys also keep down the skunk population. Something I am more concerned about since that baby perfumer took a stroll under the chair I was sitting in at a friend's house. This is also the time of year the garden tells me that it doesn't mind I have never bought mint. All you have to do with that herb is think of it- and voila! It is the unchallenged divining rod to the best parts of the garden, where she quickly populates across, daring gardeners to get the upper hand. Warning. Whatever your ritual with mint- do not put mint in the composter or she can become as one of those monster movie menaces where all the little pieces become multiple clones to battle for control of the earth. Better to engage in Détente. Consider mint as the green refresher. 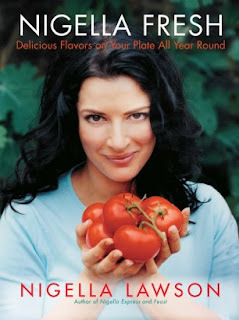 I confess skepticism reading Nigella Lawson's romantic remembrances of a simple omelets from long ago wanderings in Greece, where slivers of leaves were used to generously season a simple omelet filled with Chevre cheese. That first bite was an aha moment, where the eyelids close involuntarily. Mint is not just for sweet surrenders. It is quiet accompaniment to the slight tang of the goat cheese. A couple slices of Canadian Bacon- An English Crumpet with Irish butter and Marmalade of Seville oranges and you have my rendition of country cooking. We may be identified by our country of origin. Spoken language can keep us apart. But good food in a convivial atmosphere brings us together. Wildlife images by Gene Sasse. For the duration of the LA County Fair, you can look for him at the Millard Sheets Gallery. Even when Gene isn't there- it is an exhibit worth exploring. Passion propels excellence. It is the difference between sweet strains of Mary Had a Little Lamb and Beethoven's Symphony No. 9 in D minor. Adapted as the European Union anthem, one of the greatest of all musical creations was created against all odds. It was not a straight line from idea to creation. Many projects; life, intervened.Long before the masterpiece was finished, the maestro was completely deaf. His production would be the first major symphony to employ voices. The addition of choir and soloists shattered contemporary convention as they sang the final movement- the "Ode to Joy". Conducting the first public performance, he heard neither the music, nor the audience's appreciation. An assistant turned Beethoven around for him to see the enthusiastic rounds of applause. What made this accomplishment possible? Clarity of Passion. His shared belief with the poet-philosopher Friedrich Schilleris, who wrote the poem that "Ode to Joy" is based upon. 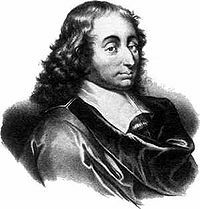 Both men believed that beauty is not merely an aesthetic experience, it is also a moral imperative. 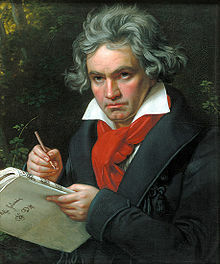 Beethoven could not hear his music- but he had such passion and clarity- he could feel the music within his soul. He kept to the discipline needed to leave us centuries later with a lesson for today. Great accomplishments can be achieved even in less than perfect circumstances. Have a vision of paradise. Let clarity of passion lead the way with courage and conviction.